Since old times, books have been the conduits of knowledge and learning. They are a symbol of civilised society, and until they perish from the world in favour of their digital counterparts they will continue to embellish shelves in millions of living rooms. Many people organise the books on their shelves alphabetically by author or title; others group them by genre, or topic; and some combine the two methods. You can call these the information architects, thinking one step ahead and organising their library for findability. Makes a tonne of sense, does it not? Most of the books that most people own spend most of their lives snuggling cosily in an upright position on a bookshelf with their spine showing off. While not being searched for, they become part of the furniture and function as visual elements in your room’s interior decoration. It therefore also makes a tonne of sense to think about what they look like, sideways, and perhaps organise them in a way which considers their contextual primary function. 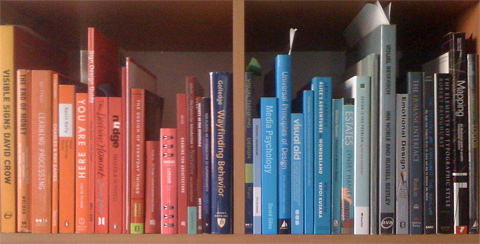 One such way could be arranging your library by the book’s physical height to create a specific silhouette (try waves or stairs), while another way could be colour-coding your library to achieve a smooth colour transition. When browsing online bookstores we typically get an image of the book’s front cover next to its description. To emulate the bookstore experience Amazon and competitor online book retailers introduced the ability to ‘look inside’ and peruse some of the book’s content prior to purchase. I have no doubt that I’m in a minority in thinking of this as 2 ticks and one missed trick. Before buying a book, I would like to also be able to examine its spine. Nice thought. And I have to admit I actually find it fairly easy to recall a book’s colour and therefore locate the required book in no time on my colour-coded shelf. Positively it is quite a personal affair–I doubt others would be as effortless with my library. V. good. I have lately wondered whether we’re exiting the era of ‘bookshelf as middle class badge’.